High Voltage, Re-wireable 50-Amp Flip Seal Plugs and Connectors by K&H Industries, Inc.
K&H Industries offers NEMA configured, rewireable 50-Amp Flip Seal plugs and connectors. K&H's exclusive Flip It & Forget It design is used for silo loaders, welding, & manufacturing. It is industrial grade and moisture, dust, and weather resistant. April 13, 2011 - PRLog -- Spring has arrived and that means it’s time to order your K&H Industries 50-Amp Plugs and Connectors! 2-Pole, 3 Wire Straight Blades: 250-Amp with K&H’s exclusive Flip Seal Design. 3 Pole, 3 Wire Straight Blades: 125/250-Amp with K&H’s exclusive Flip Seal Design. 3 Pole, 4 Wire Straight Blades: 125/250-Amp with K&H’s exclusive Flip Seal Design. • Rubber housing with phenolic insert provides rugged and durable construction. 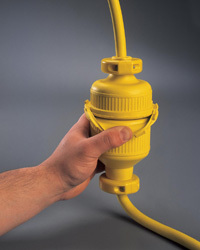 • Molded rubber lip on connector provides a moisture, dust, and weather resistant enclosure when flipped over the plug.